The blade clamps are among the first parts to fail on a scroll saw. The clamps, which are also called blade chucks or blade heads, are subject to constant vibration and are repeatedly tightened and loosened as part of any scrolling project. Further, there are problems inherent in cast aluminum that encourage users to overtighten the thumbscrew while securing the blade, which strips the threads in the head. Overtightening the thumbscrews can also split the entire chuck. Plus, poorly designed clamps are hard to use and can let the blade slip free while you cut. The new Pegas Blade Chuck Heads are the answer to these problems. Designed to fit on saws that use the link drive system (such as DeWalt, Excalibur, King, Jet, and Seyco), these are the only blade heads you will ever need to buy. In the summer of 2017, Pegas took their scroll saw to an engineering school in Switzerland and asked the students and instructors how to improve it. 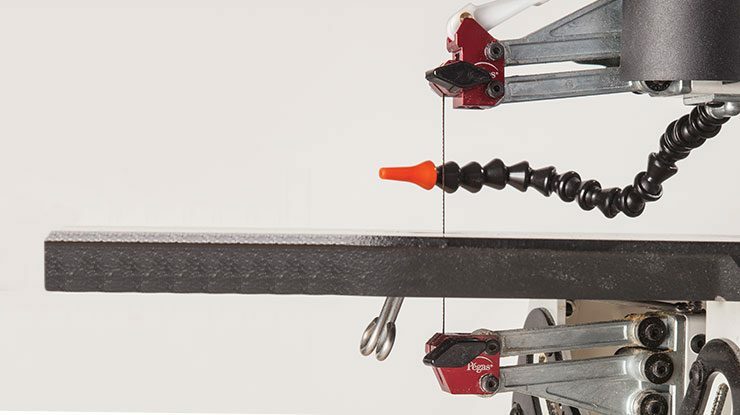 According to the engineers, the best way to reduce vibration and make the saw easier to use was to replace the standard cast-aluminum blade heads with precision machined heads made from aircraft aluminum. The grade of aircraft aluminum used in these heads is as hard as steel—much harder than cast aluminum—so they could be made smaller, but remain durable. This material also keeps the threads in the thumbscrew holes from stripping. And because the heads are machined, not cast, there’s no seam that might lead to cracking. Clarence Magee of Chenango Forks, N.Y., a long-time member of the SSWC forum, was at the point of replacing his Excalibur EX21 saw when he purchased the Pegas Blade Chuck Heads in early February. “It is a vast improvement over the original blade heads,” he said. “I broke several stock clamps trying to get the proper torque to hold the blade without slipping. It would split the holder. Now that I’ve installed the Pegas blade clamps, I can look forward to many more years of use.” As of press time, Clarence more than 40 hours of operation with the new heads and still has not had a blade slip. 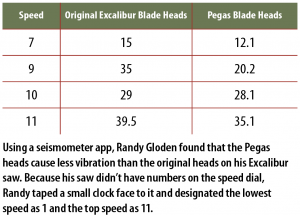 In addition, Randy used a seismometer app to examine the differences in vibration between his original Excalibur blade clamps and the Pegas blade clamps at various speeds. “I spent hours testing this, and the vibration was measurably less with the Pegas clamps,” he said. Data aside, however, Randy admitted that he didn’t notice much of a difference in vibration when he was focusing on a project. In our shop, we replaced the blade clamps on our Jet with the Pegas Blade Chuck Heads. We mentioned in our review of the Jet scroll saw in Summer 2017 (Issue 67) that we didn’t like Jet’s clamping system. The Pegas Blade Chuck Heads transformed this saw. It went from being our least-used saw to one of our most-used. The blades were easy to clamp and stayed in place after prolonged use. Carole Rothman of Pawling, N.Y., an author and SSWC contributor, agreed. In the past, Carole has been forced to use a shop-made wrench to tighten the thumbscrews on her saws. Now, she said, “I have had no problem tightening the screws by hand with the Pegas clamps installed on the Jet.” In addition, noted Carole, the original Jet clamps were “a nightmare to bottom-feed at an angle, get the blade positioned correctly, and tension it all at the same time.” Using the Pegas heads, she said, “I can top-feed when I use the Jet for bowls, which is useful for large blanks.” If you like the top clamping system on the Jet but dislike the bottom barrel clamp, Pegas is releasing a set that includes just the bottom clamp. We also tried the Pegas Blade Chuck Heads on a couple of other saws. Our King scroll saw is new, so the benefits were slight. We saw a modest reduction in vibration and had fewer blades slip out. The Pegas Blade Chuck Heads improved the performance of our DeWalt 788, once we solved one issue: adjusting the tension. The tension lever on the DeWalt is separate from the blade clamps, so installing the Pegas Blade Chuck Heads created a second tensioning method. We found reasonable success by totally releasing the DeWalt tensioner and using the blade heads to adjust the tension (and vice versa). However, we saw the least amount of vibration when we put the DeWalt tension lever in the middle and then tensioned the blade with the Pegas Blade Chuck Heads. Aware of the issue, Pegas is releasing a new kit with a standard bottom blade head and a top head without the tensioning lever for DeWalt and Delta scroll saws. That way, you can have the benefits of the Pegas Blade Chuck Heads and convenience of the DeWalt-style blade tension lever. Pegas Blade Chuck Heads are available from your favorite specialty woodworking store, or contact Grobet USA at 201-939-6700 (ask for Customer Service) or custserv@grobetusa.com to find a local retailer. The MSRP for the full Blade Chuck Heads is $90 plus S&H; the DeWalt/Delta kit is $64; the Jet bottom blade holder kit is $40.